Mid-November 2016, Vegas played host to one of the biggest conference in the elearning industry, DevLearn 2016. MGM Grand was flooded with elearning and training enthusiast from across the globe for two and a half days. True to its theme “Sparkling Creativity”, DevLearn elearning guild, brought the art of the industry under one roof. Mayflower Language Services, together with our partner Summa Linguae, added spark to the excitement with our booth at this unique conference. This was a special event for both Mayflower and Summa Linguae, as it was the first event that we exhibited as partners. From Bangalore, Krakow and Warsaw, we headed to one destination- Las Vegas. Our booth, saw businesses walk in with excitement and curiosity to find out more on how we can support their global language requirements. Mayflower, being the only Asian language service provider, solved queries that some businesses had on the Asian market. They were pleased to find how we are foreseeing and creating new channels to support the learning industry’s complex needs and unique language combinations. These needs varied from elearning localization, voiceovers, dubbing, course integration, linguistic quality assurance and much more and we were present with the solutions. Being one of the few LSPs in the industry with operations in multiple locations equipped us to provide these solutions and make the linguistic experience faster, easier and more efficient. The attendees loved the Flash drives that were given at our booth to all walk-ins. “The interactions at this event has provided us with a better picture of the growing localization needs of this industry and the different ways in which we could cater to them. 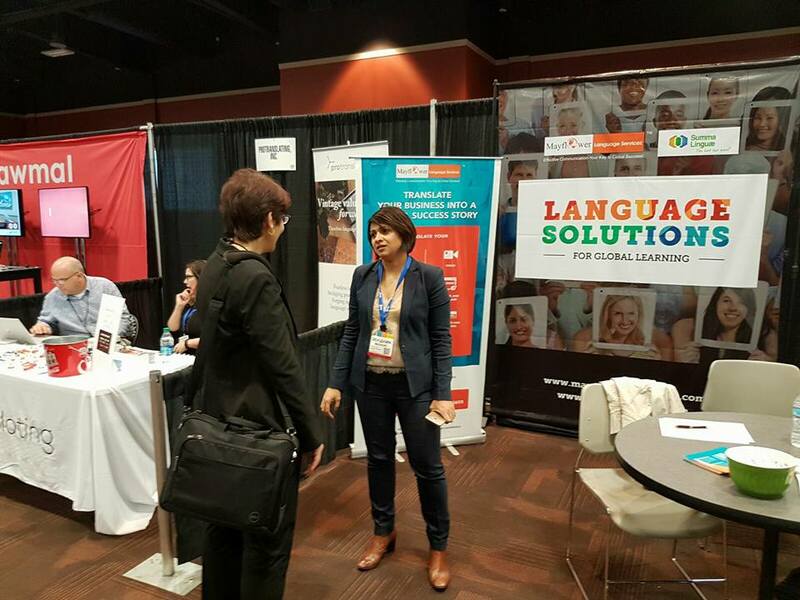 Devlearn 2016 while showcasing the best in tools and technology of the industry, highlights the importance of localizing in making the elearning process less stressful, more effective and profitable” said Madhuri Hegde, Founder and CEO, Mayflower Language Services. We were also glad to meet some of our existing clients like Aptara, JKT, Exult Corporation, LearningMate Solutions, DelphianLogic, Integra and Indecomm. The exhibitors also included other language service providers who showed keen interest in partnering with us. There were many other interesting exhibitors like eLearning Brothers and Adobe who kept the floor alive through workshops and fun activities. The language quiz by inWhatLanguage was both informative as well as entertaining. Our CEO, Madhuri Hegde stood second in this quiz and won a Nintendo Classic. Another interesting segment to the expo was the Swag Shop where one could redeem the points won by sharing things on social media against fun goodies. While the expo was power-packed with the latest in technology, learning, fun, and entertainment, the conference was no less with interesting seminars. “An interesting seminar was a case study on Emirates Airlines, Alaska Airlines and Adobe on how such global companies use e-learning to train new employees and how the role of translation and localization of e-learning content is crucial to keep the integrity and unify the procedures while diversifying the content from one country to another.” Said Krzysztof Zdanowski, CEO and Co-founder, Summa Linguae on his experience at the conference. DevLearn 2016 was a phenomenal experience that brought together people, ideas and spirit of the industry and provided insights on what lies ahead. The event showcased the latest and best in tools in the learning and development industry. It also gave a peek into how virtual reality, augmented reality and big data can change the learning experience. As the industry progresses towards m-learning, app-learning and gamification, teaming it with localization will help the industry move away from the on-size-fits-all formula to provide a more effective and more personalised learning experience. The future of the e-learning industry as it expands, paves way to innovative localization solutions that can support and sustain the growth of elearning companies across the globe. Mayflower and Summa Linguae look forward to supporting these unique requirements from and to the different parts of the world.